Listenin to B.I. is the first true musical offering of the EP. RJBeats gives you a beat that is best described as being buttery smooth. It has that South Beach feel, where you can glide in your ride and let the music carry you wherever the destination may be. It also has just a touch of soul that enriches the track just that much more. Emilio Lopez is killing time, and hopes time forgives him on the mic. It’s just a very relaxing hip hop cut for the audience to zone out to. Taste The Dro is a track that feels like it was taken directly out of the 1980s TV show, Miami Vice. The saxophone that hovers on top of the drums really puts the stamp of distinction on this joint. Lopez flavors three different types of verses over this track. He has some introspective words and some narrative material but it all comes through as dope. 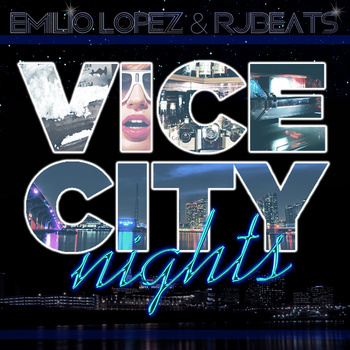 Vice City Nights is smooth, slick, and jazzy and puts Emilio Lopez in a new light. It shows his ability to incorporate new elements and vies into his vast expanding repertoire. I think the most pertinent item to take from a release like this is that it transports you to a different time and place which again reflects the power of music when brought to it’s farthest potential. The project is multidimenstional yet easy going, and sure to bring a smile to the face of even the hardest of individuals.